The chart from chartcraft.com below shows that stocks comprising the NYSE composite have been in the midst of a selling climax. That historically indicates that they are set for a rebound, at least in the short-term. Why? Selling climaxes occur when stocks make a 12-month low but then close the week with a gain. That indicates the stocks are being accumulated and buyers are out numbering sellers, driving prices higher. Conversely buying climaxes occur when stocks reach a 12-month high but close the week lower, indicating the stocks are headed down. How do we know this is important news for investors? 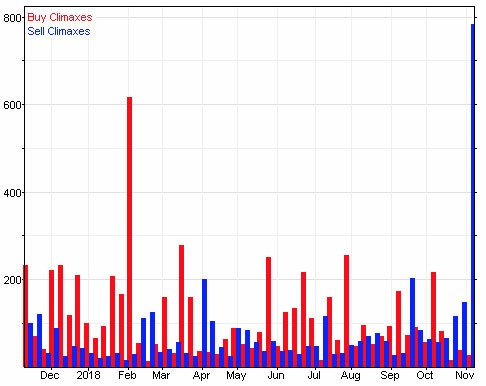 Chartcraft.com says its studies indicate buyers into a selling climax and sellers into a buying climax are right 80% of the time after four months of time. In other words, odds are the recent selling climax should be good news for bulls in the short-term. The CNN Fear/Greed is at 8, indicating there’s a lot of fear among investors. The Ned Davis Research (NDR) short-term gauge is at 23, suggesting the market is oversold. Used as contrarian indicators since investors historically are wrong, that means we should be expecting some market rebounds following the recent big selloffs that devoured gains for the year. What does this all mean? There’s likely some buying opportunities for the remainder of 2018, barring unforeseen events that would put the markets into a tail spin. Longer term, economic indicators (such as climbing interest rates and abnormally high price/earnings) are suggesting that there could be some rough times ahead in 2019. Breadth lacks Oomph with many S&P stocks down 20%. 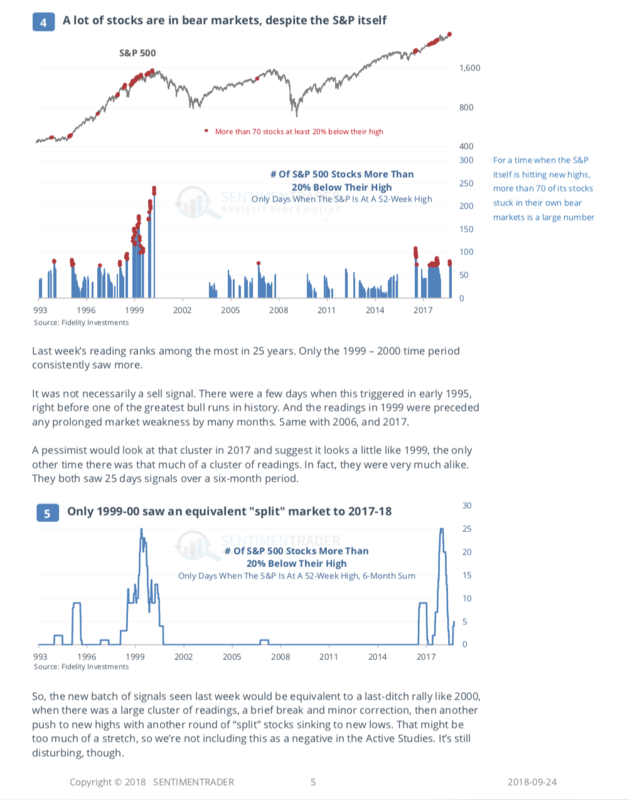 Jason Goepfest of Sentimentrader came out with this outstanding study last week and I wanted to share it with you. While the market continues higher the participation has become narrow and traditionally a charctoristic of a top in the stock market. 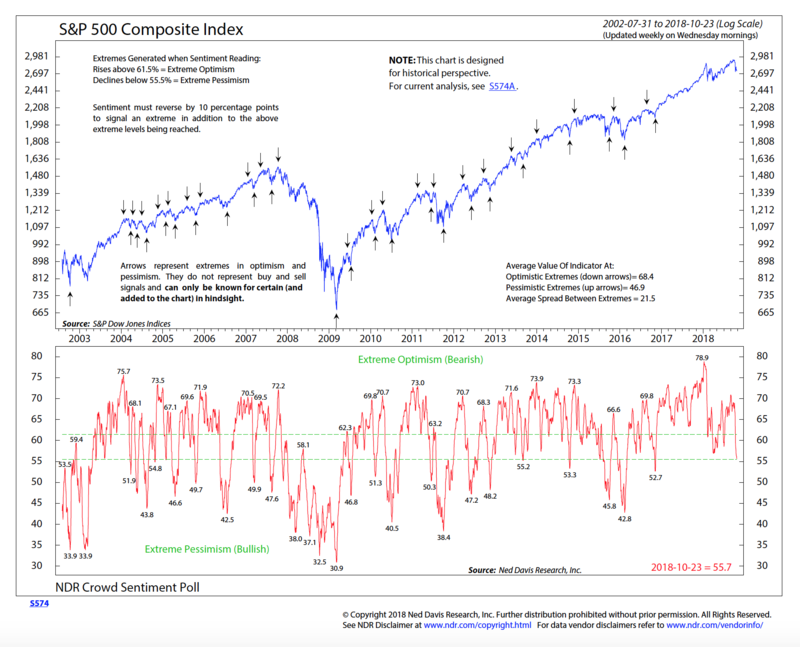 Intermediate term sentiment is quite negative. Investors-intelligence Bulls/Bears, which monitors attitudes of more than 100 market newsletter writers, is at 60% bulls and 18% bears. That’s very negative from a contrarian point of view. The difference between the bulls and bears is now at 42, which is an extreme warning sign. 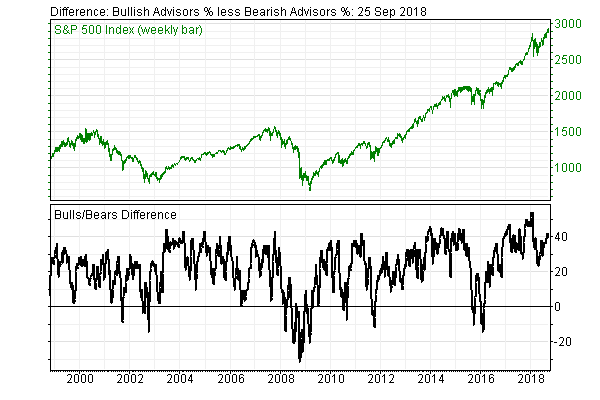 The Ned Davis Research Crowd sentiment is at 69, one point away from the official sell signal of 70. On the other hand, short-term sentiment indicators are not signaling one way or the other about where the market was headed. 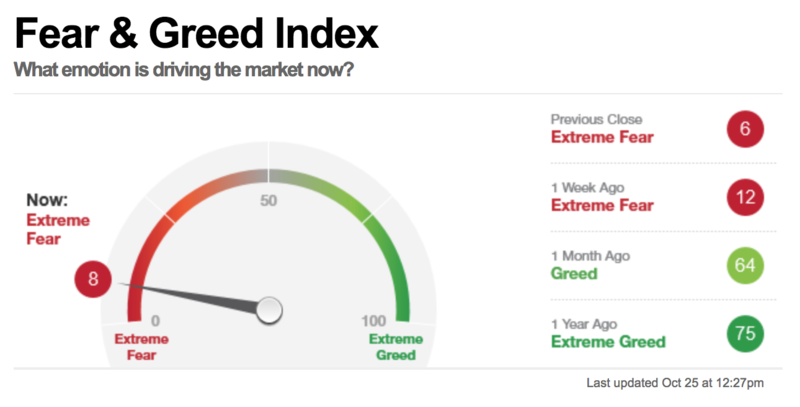 The CNN Fear/Greed Index is at a neutral 46. And the NDR short term sentiment is at a neutral 51. On future direction at this time. 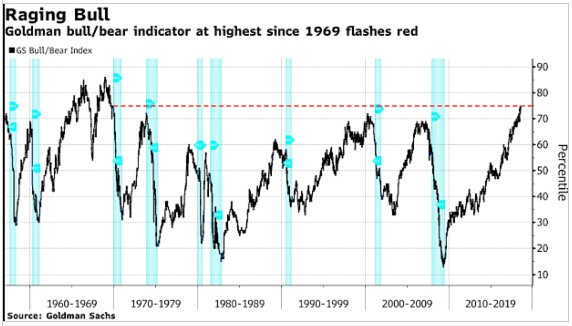 This indicator, designed by Goldman Sachs to signal bear market risk, is at its highest levels from the last 50 years. It is based on measures of equity valuation, growth momentum, unemployment rates, inflation and the yield curve. It attained peaks towards the end of the internet bubble and near the end of the housing bubble. The gauge often precedes a bear market but is sometimes indicative of a prolonged period of low index returns. 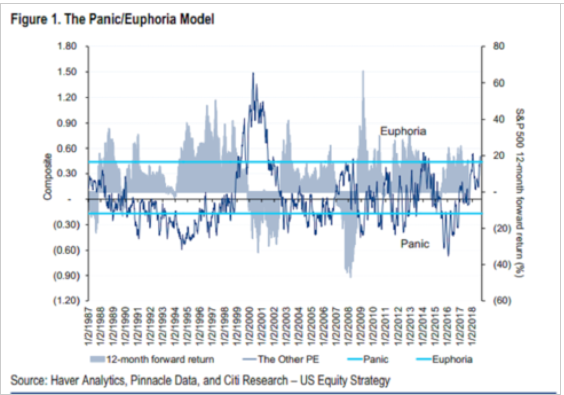 Another metric on investor behavior is the Haver Analytics/Citi Research Panic/Euphoria model. The model relies on their Market Sentiment Composite. It is intended to track the mood of the investor base and is used as a contrary signal. Note below that forward returns based on euphoric readings, are low, meaning that the market tends to fall or tread water after the indicator breaches the upper threshold. Investors have returned to favoring growth stocks. July appears to have been an aberration in that growth characteristics lagged. Through August and into the first week of September, companies with high forecast growths are leading the market again.